The Grand Turk Cruise Center is a 13 acre complex and cruise port on the southern end of Grand Turk. This site serves as the launch point for cruise ship shore excursions, and offers onsite gift and jewellery shops, restaurants and a spa, as well as the largest Margaritaville in the Caribbean (which features a swim-up bar). As many as three ocean liners are welcomed here each day. The beautiful Cruise Center Beach (SunRay Beach) fronts the complex, and is one of the nicest cruise port beaches in the region. Unlike many other Caribbean vacation cruise stops, Grand Turk is a very small island, and offers a completely different atmosphere than better-known destinations. There isn’t a crowded city or waterfront, just a laid-back little town with great beaches and a little British Bermudian Colonial heritage. The Grand Turk Cruise Center is the only cruise port in the Turks and Caicos, and the $50 million complex was opened by Carnival Cruise Lines in 2006. The Grand Turk Cruise Center offers shopping, dining and the onsite attractions of the pool and FlowRider. Tours and excursions also leave from here to the rest of the island. 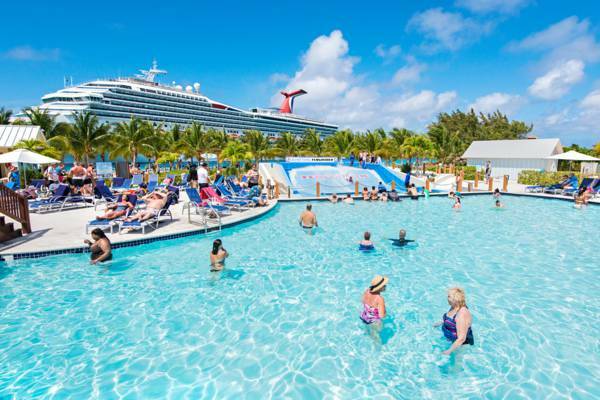 The highlight of the Grand Turk Cruise Center is the huge, lagoon-like swimming pool. Private pool-side cabanas with waiter service can be rented, but be sure to reserve yours early as availability is limited. The Cruise Center is located on the beautiful Cruise Center Beach (also known as SunRay Beach), and the section next to the cruise ship pier is the poorest section – you’ll want to head north up the coast a short distance to experience the best sand and water. Here you’ll also find Jack's Shack, a popular restaurant to grab lunch. Complimentary beach lounge chairs are found fronting the complex, although depending on the number of ships in port, this area of the beach can become extremely crowded. To the south of the Cruise Center, the beach becomes a bit more secluded, albeit rocky as well. If you continue to the southern point of Grand Turk, you’ll be at Boacy Rock Point, and near some snorkelling reefs. Further on isWhite Sands Beach. The unparalleled Governor's Beach is found less than a mile (1km) to the north, unfortunately, it’s not possible to walk to this location on the beach due to the Government Dock which interrupts the coast. It’s necessary to take the inland roads to get to Governor’s Beach.